Goa Gajah is a significant Hindu archaeological site. Located in the Bedulu Village, six kilometers out of central Ubud in Bali, Goa Gajah is known as Bali’s sacred Elephant Temple. One of Bali’s most significant archaeological sites, Goa Gajah has Hindu origins. A small cave with an intricately carved entrance way, a central meditation cave, bathing pools and fountains have been revealed with ancient spiritual and philosophical connections. 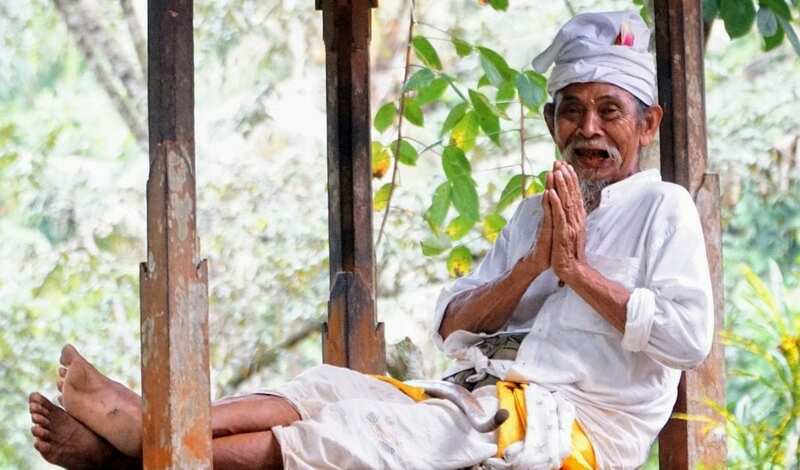 A Hindu man approached us to be our guide and took us around the site telling the story of Goa Gajah. It’s worth the experience as he told the story from his heart. Goa Gajah is thought to date back to the 11th century, although relics predating this time were found within the site. The first known mention of Goa Gajah and the Elephant Cave was in the Javanese poem Desawarnana written in 1365. Despite the ancient significance of the Elephant Cave, the last excavation took place during the 1950’s. Today, much of the site still remains unexplored with piles of relics laid out in an adjoining garden. The leading theory suggests that Goa Gajah was used as a hermitage or sanctuary by Hindu priests who dug the cave entirely by hand. Although accredited as a sacred Hindu site, a number of relics and the nearby Buddhist temple suggest that the site held special significance to early Buddhists in Bali. The main grounds are down a flight of steps from the roadside and parking area, which is lined with typical souvenir shops and refreshment kiosks. Goa Gajah was built on a hillside where two small streams meet and form a ‘river junction’. The northern side of the complex is dominantly Buddhist while south across the river it’s mostly Shivaite. At the southern end are beautiful rice fields and small streams that lead to the Petanu River – another natural site entwined in local Balinese legends. The main excavation reveals a large ‘wantilan’ meeting hall and an assortment of large old stone carvings, some of which have been restored to their former full glory. 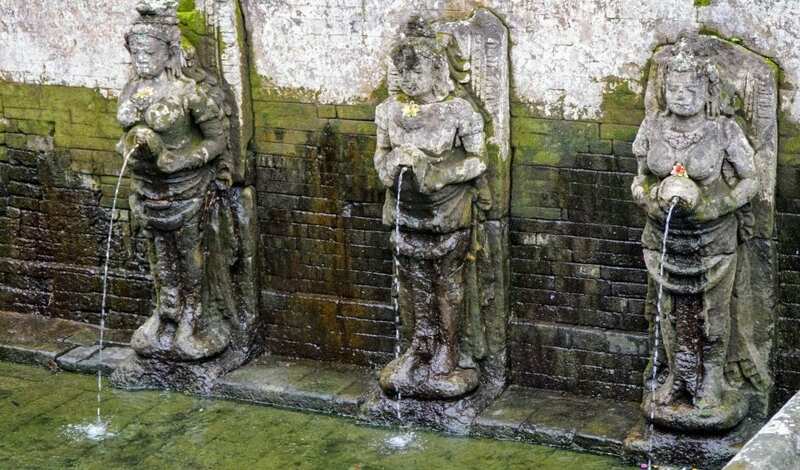 The pool was last excavated in 1954 and features five out of supposedly seven statues depicting Hindu angels holding vases that act as waterspouts. Various nearby structures reveal Hindu influences dating back to the 10th century, with some relics featuring elements of Buddhism dating even earlier, to the 8th century. The place is dominantly Hindu but exploring some parts will give you an impression that during the early years it was influenced by Buddhism. The Elephant Cave is relatively small and has narrow passages. There are no lights other than candles inside the cave so the inner cave will be quite dark until your eyes adjust. Black soot lines the cave’s walls from the current-day incense burning. The right passage holds a small worship area with several stone statues of lingam and yoni in honor of Shiva whilst the left you can see a small statue of Ganesh, the Hindu deity reminiscent of an elephant. Hermeticism is an ancient spiritual, philosophical and magical tradition considered a path for spiritual growth. The site was considered sacred and was built for hermetic meditation and prayers. The cave’s entrance looks like an enormous mouth that represents the door to an underworld. According to the folklore the entrance is a representation of Bhoma, the Hindu Earth God, while some say that it is the mouth of the witch Rangda who eats children in Balinese mythology. The Elephant Cave is best known for its religious and archaeological significance but only takes a short time to explore. Stone stairs will take you down into the beautiful garden area where you can take a short walk to view beautiful ponds and waterfalls. The remains of a crumbled Buddhist temple rest nearby; ancient stones with carved reliefs lie strewn with boulders in the river as rushing water erases history. 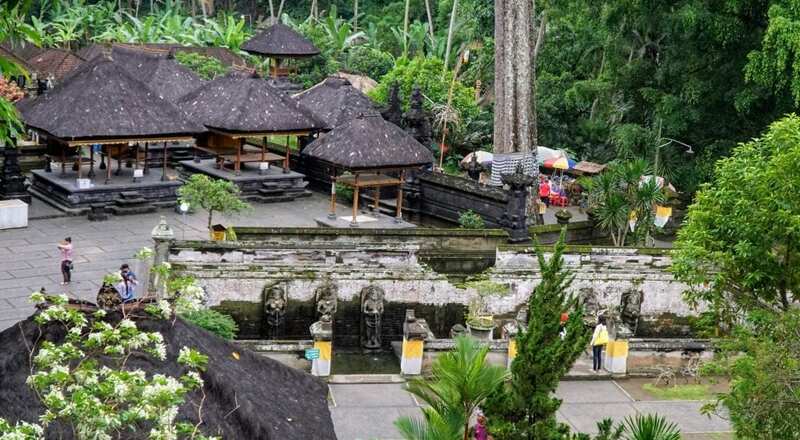 Perhaps their greatest achievement was having Goa Gajah listed as a UNESCO World Heritage Site in 1995 so that this incredible site can be preserved forever. Pin this in Pinterest .. I was quite blown away by the historical significance of this site. 11th Century! Wow! What was life like then? How did people live? What a significant find for Bali! Have you been to Goa Gajah the Elephant Cave in Ubud, Bali yet? What did you think of it all? Were you as fascinated with such a significant archaeological site as I was?